Quiz question number two: how many roller coasters are at Disneyland proper? There's four, if you're counting the Matterhorn Bobsleds (and you should). Big Thunder is up there in terms of thrills. You may or may not know about the Goat Trick. It's where you wait until you see the goat animatronic on the ride, then try to keep your eyes on him while the train goes through a huge turn. It's also a great way to make yourself dizzy if you have problems with that, so don't try it. That goat area has also been a pretty good way to get a peek into the Star Wars: Galaxy's Edge construction. Just saying. There's also a set of dinosaur bones near the end of the ride. Told you so. The ride being fun isn't the only great thing about it. Before Big Thunder came barreling down the tracks, there was another train ride occupying the same spot. It was called Mine Train Through Nature's Wonderland, and even that ride was a reimagined version of a previous attraction, the Rainbow Caverns Mine Train. There's still artifacts from these attractions around. The town of Rainbow Ridge is present at the end of the ride. Many of the animatronic animals (maybe even the dizziness goat!) are from the Nature's Wonderland ride. And there's even a part where you ride through rainbow-themed caverns. You might have seen a weird mysterious looking tunnel outside the queue from Big Thunder. This also used to be part of the old train ride... Now it's just a weird ominous cave. The jumping fish in the lake near the tunnel are also remnants of Nature's Wonderland. Sorry, they're not real, but they are real...ly old. Caves are full of stones, right? Okay, keep that in mind, because this is gonna get weird. This has only been documented at Disney World, but it's too crazy to not include here. 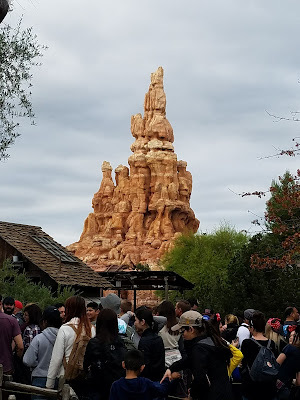 Big Thunder can help you pass a kidney stone. Hear me out. I'll try not to include too many gross details. A man by the name of Dr. David Wartinger had a paper published by the Journal of the American Osteopathic Association suggesting that riding a roller coaster could help a patient pass a small kidney stone. With permission from Disney, he and his colleague took a silicone model of a kidney (with stones) on Disney World's version of Big Thunder for a combined total of around 250 times. Guess how many times it worked. Did you guess 70% of the time? Because that's what it was. I told you it was the wildest ride in the wilderness.